We pack a colourful punch this month with bright, flowering suggestions for you to plant and sow right now. Enjoy the beautiful face of October! 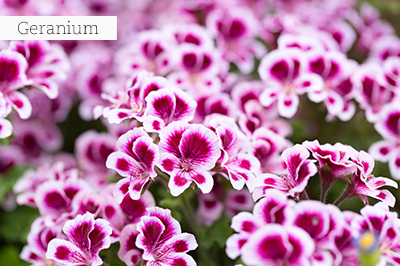 Fill up pots, window boxes, your rock garden, and the openings in cement retaining walls with pelargoniums (more commonly known as Geraniums) in different colours. These plants are ideal to add colour to hot and sunny places. – The right soil: Geraniums hate wet feet and heavy, slow draining soil. Use a good quality commercial potting mix for pots, and condition garden soil with lots of compost. – The right food: Keeping these plants hungry for food will cause them to sulk and stop flowering. They are gross feeders and need feeding in the garden every six weeks with a slow release general fertiliser. Plants in pots should be fed fortnightly throughout the year with a water soluble fertiliser. – The right cut: Remove spent flowers regularly and prune the plants back in spring or autumn to keep them bushy. Tattered old plants can be given a new lease on life by cutting up to two thirds of the plant away, ensuring you leave some leaves on the plant. – The right way with water: Geraniums are water wise. Only water them when the surface of the soil is dry. Jasmine time – the October stalwart must be star jasmine (Trachelospermum jasminoides). This versatile creeper with its glossy, dark green foliage and aromatic, pure white flowers, can be used to trail over pergolas and fences and if planted in mass, as groundcovers under trees. It grows well in pots too. For a year-round visual effect plant Cordyline ‘Electric Pink’ which will give you splashes of vivid pink shades on a naturally multi-stemmed plant. These Cordylines are tough, easy to grow plants and grow to about 1m high x 1m wide. Pests and diseases seldom attack them. 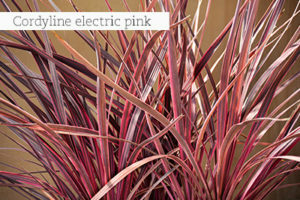 Full sun or light shade are perfect for Cordylines and so are large containers. They combine beautifully with soft ornamental grasses in mixed borders, and are great near a swimming pool. Their root systems are not aggressive and they are not messy plants. Regular water will ensure very lush foliage, but never overdo it, as these plants can survive dry periods once established, without losing their splendour. A general rating will be low to medium water usage. 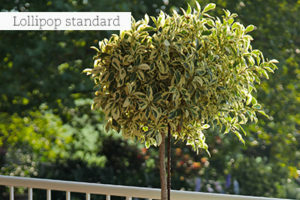 Regular feeding during summer will result in healthy plants with bright and colourful foliage. Use a normal balanced fertiliser. Planting lots of different perennials regularly and when in season, means that your garden will have a diverse array of lovely plants throughout the year. 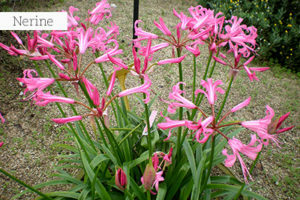 ‘Perennial’ normally refers to herbaceous plants which live for more than two years. Perennial agapanthus have been hybridised to give us varieties with longer and repeat flowering capabilities. 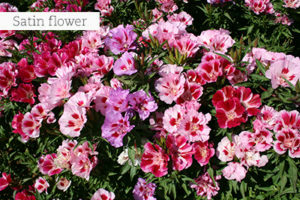 These plants are very floriferous and tough, withstanding frost and long periods of drought. ‘Buccaneer’ – repeat bloomer, producing white flowers with deep purple stripes. ‘Bingo Blue’ – dark blue flowers from late winter to mid-summer on semi-dwarf plants. ‘Bingo White’ has pure white flowers. Keep agapanthus happy by planting them in full sun or light shade. Water regularly but don’t overdo it, and feed them with a slow releasing fertiliser in spring. 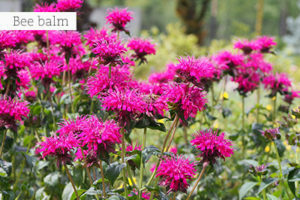 Bergamot or bee balm (Monarda) appears again every year as soon as temperatures rise. Then, the garden becomes abuzz with pollinating insects and those that control garden pests. Bergamot belongs to the mint family and the leaves when crushed exude a spicy, fragrant oil. It is very trendy to use perennials like bergamot, butterfly bushes (Gaura), shasta daisies, and tall grasses to create wild-looking prairie garden beds this year, and with bergamot in your yard, you will also have the peace of mind to know that you are being kind to garden wildlife! Buy these economical indigenous perennials which are widely available: Wild iris (Dietes grandiflora), hairbells (Dierama pendulum), cobra lily (Chasmanthe floribunda), miniature hen and chickens (Chlorophytum ‘Gold Nugget’), C. saundersia and yellow cat’s tail (Bulbine abyssinica). All grow fast and form thick clumps. Make it a spring resolution to sow easy-to-grow cut flowers. This is a very good reason to get down and dirty, and which gardener doesn’t love wandering through a meadow filled with lots of colourful flowers to pick? Seed companies nowadays supply seeds of the most popular garden flowers in mixed, as well as in single colours, and even go as far as mixing different combinations of flower seeds together into jumbo packs for sun and shade. This seems to create a meadow effect when flowering starts. To sow directly means to sow seeds in the bed in which they will grow to maturity, as opposed to planting them in seedling trays and transplanting them later. The soil in flowerbeds should never be allowed to dry out after the seeds have been sown. If necessary, give it a light sprinkling of water twice a day. As soon as germination has occurred and the first true leaves show, you can reduce watering. Beauties to sow now include: Satin flower (Godetia), spider flower (cleome), cosmos, sweet william, sunflower, bells of Ireland, love-in-a-mist, Zinnia, Achillea, Queen Anne’s lace, asters, cornflowers, baby’s breath, carnation, nasturtium and aster. October is rose month! You can plan a new rose garden or fill up an existing one by visiting your GCA nursery to view new releases, as well as old favourites such as ‘Oklahoma’, ‘South Africa’, ‘Just Joey’ and ‘Satchmo’ which are still top sellers. Although roses dislike disturbance around their roots while growing actively again, they do enjoy the presence of a living mulch. Try a few dainty groundcovers and perennials, and add more colour and romance to the rose garden. Bright colours and flowers to add now include creeping Jenny (Lysimachia ‘Aurea’), cranesbill (Geranium incanum), snow in summer, (Cerastium tomentosum) chives, Brachyscome daisies in different hybrids and colours, bindweed (Convolvulus), candytuft (Iberis sempervirens), corn flowers (Scabiosa) and sweet violet (Viola odorata). The very best living mulch is, of course, the white Sweet Alyssum – it stays compact, does not interfere with the rose roots, is scented, neutral in colour and reseeds itself. Time to colour in your shade. 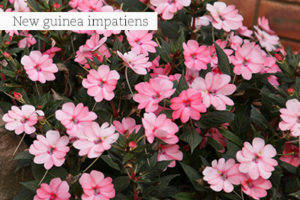 Since the worst cold and frost is now over, invest in New Guinea Impatiens. They are available in colours for every taste. You can also plant impatient power in the sun, by asking for ‘Sunpatiens’ at your GCA nursery. Don’t lose your impatiens… Be sure to put out crushed egg shells around newly planted impatiens, as the snails love their soft leaves and pretty flowers. The appearance of broadleaf weeds on the lawn, patches of discoloured lawn, and even patches of soil where lawn has been completely destroyed, should be dealt with this month. Weeds compete with plants (in this case grass) for moisture, nutrients, light, and space, leaving the lawn looking yellowish brown, and eventually completely weed-ridden. Fertilise your lawn first, water well and keep on mowing. If absolutely necessary, visit your local GCA Garden Centre for advice on what to spray your lawn with. Freshen up garden containers of specimen plants, like lollipop standards, by pruning them neatly to maintain a round shape. Add a layer of compost and plant some bright red bedding begonias around the stems. Repot ferns into fresh potting soil and start feeding them every two weeks with a liquid fertiliser mixed at half-strength. Orchids and ferns love humidity in the atmosphere, so place them on pot trays filled with gravel and a little water. Do not let the base of the pot stand in water, or the plants will rot. Use potted roses to brighten up indoor rooms or your patio. In the rose garden and orchard, remove any growth sprouting from below the graft bud union on the mother stock. Neaten up flowering peaches, almonds and ornamental quinces as soon as they have finished flowering. Put out crushed egg shells amongst strawberry plants to discourage snails and provide a mulch of straw, coarse clippings, or weed matting to prevent the fruit from touching the soil. Pick the fruit frequently to encourage new ones. Remember to apply mulches around all shrubs and trees to conserve moisture in the soil around them, regardless of the amount of rain which has fallen. Cut off the dead flower stems of winter-flowering aloes and check around the base of your plants for small pups (plantlets) which can be planted out in pots or in other areas of the garden. Watch out for insects such as aphids, mealybugs and whitefly on soft new growth and control with the correct insecticide. Visit your local GCA Garden Centre for advice on the right one. Thin out peaches, nectarines, apricots and plums when they are about pea-size. Continue spraying and baiting against fruit fly and codling moth. Inspect all members of the lily family such as agapanthus, Crinum, Clivia, Nerine, Amaryllis and Haemanthus for lily borer, a caterpillar which have transverse yellow and black bands around the body. They are most active at night and can be treated with a contact insecticide.